Tim has been called “a consummate cabaret performer” by Cabaret Scenes Magazine. He is a singer with over a dozen solo shows to his credit. KDHX St. Louis refers to his performances as “madly entertaining”. He has headlined his shows at the prestigious St. Louis venues The Sheldon Concert Hall, The Bistro at Grand Center, Gaslight Cabaret Festival, among many other clubs and performing arts centers. Regionally/nationally he has performed at Davenports (Chicago), Geist Cabaret (Santa Fe), in addition to venues in Boston, Colorado, Iowa and Washington DC. St. Louis’ Riverfront Times says of his cabaret work, “expect great things”. Tim is co-founder of The St. Louis Cabaret Conference and is solely responsible for choosing faculty, curriculum and students. Under Schall’s guidance The St. Louis Cabaret Conference has developed into one of the top song performance training programs in the country with a renowned, award winning guest faculty that attracts more than 30 singers each year from all over the nation. Additionally, he has taught numerous Advanced Performance classes and directed nearly 30 full length cabaret shows and showcases for various singers, including Tony nominee Lara Teeter’s acclaimed New York cabaret debut at 54 Below in 2014. Tim served as adjunct faculty at Webster University teaching their Cabaret Styles Performance class to seniors in the University's Musical Theater Conservatory. Schall is also the Executive Director of The Cabaret Project of St. Louis (TCP), a non-profit with a mission to support, develop and sustain the art of cabaret. Under the banner of TCP, Schall serves as has presented such talents as Christine Ebersole, Ann Hampton Callaway, Faith Prince, Marilyn Maye, Billy Stritch, Jason Graae, Liz Callaway, Andrea Marcovicci, Barbara Fasano and Eric Comstock. Cabaret Scenes Magazine highlighted his work as a cabaret force in a 2009 feature article. Tim owns and operates a private vocal performance studio in St. Louis. Tedd is a New York City based musical director, jazz pianist and arranger. As musical director and accompanist he has worked with Barbara Cook, Brian Stokes Mitchell, Maureen McGovern, Tom Wopat, Marilyn Maye, Michael Feinstein, Joshua Bell, Elaine Paige, Tony DeSare, Linda Lavin, Christine Ebersole, Lucie Arnaz, Lee Ann Womack, Faith Prince, John Schneider, Melissa Errico, Karen Akers, Mary Cleere Haran, Margaret Whiting, Carol Sloane and many others. Among the jazz musicians he has performed or recorded with are John Pizzarelli, Houston Person, Frank Wess, Mark Whitfield, Red Holloway, Benny Golson and Joe Morello. New York appearances include Carnegie Hall, Lincoln Center, the Blue Note, Birdland, the Iridium, the Algonquin, the Cafe Carlyle and Feinstein's at the Regency. Numerous national appearances include a performance at the White House. As an arranger/orchestrator, Tedd's work has been performed by most major American symphony orchestras as well as Bernadette Peters and Liza Minnelli. Television appearances include "The Today Show," "Live From Lincoln Center", "All My Children" and PBS’ "Michael Feinstein at the Rainbow Room." His television appearances include CBS THIS MORNING; "THE 1959 BROADWAY SONGBOOK" (PBS) and as the singing narrator of "GERSHWIN ON ICE" starring Dorothy Hamill (A&E), He is perhaps best recognized for his signature "theme" shows. In collaboration with Director Sara Louise Lazarus and Musical Director Alex Rybeck, including he created "THE 1959 BROADWAY SONGBOOK," "BECAUSE OF YOU: 50'S GOLD," "A COLLECTIVE CY: Jeff Harnar sings CY COLEMAN," "CARRIED AWAY: Jeff Harnar sings COMDEN & GREEN," and GERSHWIN'S HOLLYWOOD," Jeff has brought these shows to major rooms for his New York appearances and Performing Arts Centers across the nation, as well as to London, Paris and Oslo. Faith Prince has been dazzling Broadway audiences since winning the Tony, Drama Desk and Outer Critics Circle Awards for her performance as “Ms. Adelaide” in Guys and Dolls. In 2008, she was nominated for Tony, Drama Desk and Outer Critics Circle Awards for A Catered Affair. Other Broadway credits include The Little Mermaid, Bells Are Ringing (Tony, DD, OCC noms), Nick & Nora (OCC Award), Jerome Robbins’ Broadway (Tony, DD noms), Little Me, The Dead, and Noises Off. She also starred in the world premiere of Terrence McNally’s Unusual Acts of Devotion. Most recently, Faith starred in the national tour of the Broadway hit Billy Elliott. Faith’s television appearances include Modern Family, Chicago Justice, Angel From Hell and her recurring roles on Melissa and Joey, Lifetime’s hit series Drop Dead Diva as Brooke Elliott’s mother, “Elaine.” , Showtime's Huff starring as “Kelly Knippers," the love interest of Oliver Platt, and five seasons on Spin City. Other television credits include A Gifted Man, Happy Endings, Ugly Betty, Grey’s Anatomy, CSI, Faith, House, Medium, Sweet Potato Queens, Monk, and more. Film credits include Our Very Own, Picture Perfect, Dave, and My Father the Hero. Faith works often with the Boston Pops, Utah Symphony, Cincinnati Pops, and Philly Pops, and recently starred in the Orlando Philharmonic’s concert version of Sweeney Todd. Faith toured her show Moving On in Australia to rave reviews, and also toured in Over the Rainbow, a concert celebrating the centennial of Harold Arlen. Faith’s album, Total Faith, was recorded at the Royal Room in the Colony Hotel in Palm Beach and will be released soon. Her award winning album, A Leap Of Faith, was recorded at Joe's Pub and is available on DRG records. Pianist, composer, arranger well known for his work in theater, cabaret and recordings. 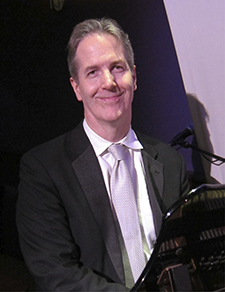 Alex has served as the music director, accompanist and arranger for Broadway stars Liz Callaway, Ann Hampton Callaway, Marni Nixon, Faith Prince, Jason Graae, Tommy Tune, Lee Roy Reams and many others. He is a multiple MAC award winner and one of the top cabaret and concert music directors, accompanists, & arrangers in New York. His accompanying/arranging credits can be heard on numerous CD’s: “Sibling Revelry” (Liz and Ann Hampton Callaway); three solo albums by Liz Callaway; five solo albums by Jeff Harnar; “Leap of Faith” (Faith Prince); “Try to Remember” (Rita Gardner), among others. Alex’s Broadway credits include: Sondheim’s Merrily We Roll Along, Tommy Tune’s Grand Hotel and the hit revival of Damn Yankees. Alex conducted the New York workshop and San Diego premiere of Burt Bacharach’s What The World Needs Now. He is a graduate of Oberlin College and New York University. Alex has taught for 6 years on the faculty of the Cabaret Conference at Yale University. Alex taught for 6 years at the Cabaret Conference at Yale and this is his 8th summer with the St. Louis Cabaret Conference. Christopher Denny has served as musical director, arranger and pianist for such theater, cabaret and opera luminaries as Karen Mason, Julie Wilson, Brent Barrett, Gregg Edelman, David Campbell, Tammy Grimes, Andrea Marcovicci, Lauren Bacall, Dorothy Loudon, Judy Kaye, Kaye Ballard, Jeff Harnar, Steven Brinberg and Tommy Femia. He has earned two Back Stage Bistro Awards and four Manhattan Association of Cabarets and Clubs (MAC) Awards for Outstanding Musical Direction. His thirty-year career has taken him to virtually all of the major venues in New York and throughout the U.S., notably including Carnegie Hall, the New York Pops as well as to Barcelona’s great opera house, the Gran Teatre del Liceu, to Australia, Italy, Switzerland, Mexico, Paris and London’s West End. He produced the recording sessions of Placido Domingo for Baz Luhrmann’s Oscar- winning musical film, Moulin Rouge. Denny was musical director for following theatrical works: Norman Mathews’ musical, You Might As Well Live, starring Karen Mason, in the New York Music Theater Festival; the New York premiere of Bob Merrill’s, The Prince of Grand Street; Barry Kleinbort’s hit revue, Big City Rhythm; The Songs of Kurt Weill, starring Kitty Carlisle Hart and many others. As a private vocal coach, he has worked well-established stars, including Boyd Gaines, Ethan Hawke, John Cameron Mitchell, Melissa Errico, Anthony Rapp, T.R. Knight, Jack Noseworthy, Austin Pendleton, among many others. His teaching credits includes serving on the faculty for professional French musical theater performers in Paris, under the auspices of the French organization, giving master classes and individual coaching to the B.F.A. students at the University of Indiana (Bloomington), seven years on the faculty of Perry-Mansfield in Steamboat Springs, CO; The Cabaret Conference at Yale University; The Cabaret Symposium at Eugene O’Neill Theatre Center in Waterford, CT. His work can be heard on about 30 CD’s of performers including David Campbell, Brett Barrett and Karen Mason, among many others.